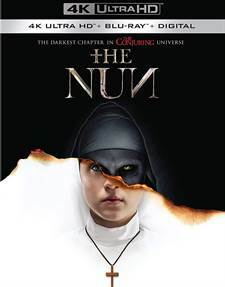 Download The Nun in Digital HD from the iTunes store. The Nun images are © New Line Cinema. All Rights Reserved. There's something to be said for persistence and in some cases, it can trump raw talent. This is the case with the newest and 5th installment in the Conjuring series, The Nun. Released by Warner Bros, produced and co-written by James Wan (Saw) and directed by Corin Hardy (The Hallow). 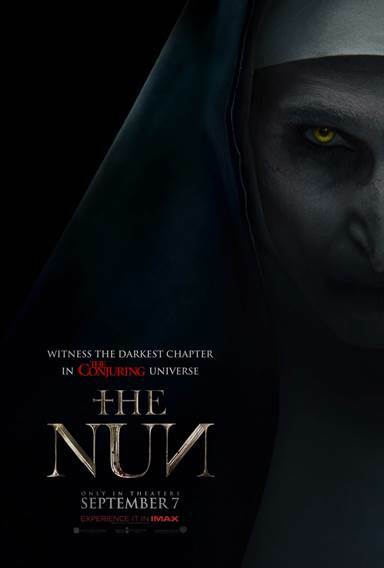 The Nun stars Father Anthony Burke (Demian Bichir, The Hateful Eight), Sister Irene (Taissa Farmiga; 6 Years), Frenchie (Jonas Bloquet; 3 Days to Kill), the Demon, Valak (Bonnie Aarons; The Fighter) and Sister Victoria (Charlotte Hope; The Theory of Everything), and continues the mythology set up in The Conjuring 2, by providing us with Valak, The Demon's, origin story. The Nun was an extremely atmospheric film, with a few unique and truly creepy set pieces. Unfortunately, it relied on far too many "jump scares" which seemed tired and lazy. I was really interested in seeing this movie, especially since the titular character is an imaginative and unsettling creation. I would have liked to have seen a more creative showcase of her powers, perhaps more of a physical manifestation of Hell-on-earth, in the monastery; possessions, or perhaps other Demons, summoned by Valak. The plot seemed to wander a bit and I had mixed feelings regarding the ending of the movie. The obvious need to establish the timeline/continuity and the heavy-handedness of the conceit were at war with each other. I don't want to give anything away, for those that have yet to see the movie, but suffice it to say I was hoping for a bit more ingenuity. With the release of this movie on all formats, in this case, 4k UHD, if you plan on buying this movie, to add to your growing horror collection, this is probably the format to choose. With the 4k (2160p) video quality and original aspect ratio of 2.39:1, The Nun looks fantastic. Much of this movie, for obvious reasons, is dark but this version presents itself, and depth of field, beautifully. True black has never been more real, and some of the scenes seem to glow with an almost unearthly light. It's stunning, and having seen it in the theater, and again at home, it makes me appreciate the look and tactile sense of the film all the more. Not to be outdone is the Dolby TrueHD 7.1 audio. It helps create an absolute immersion into the haunted monastery. All channels are firing on this one, with a great buildup of dread not to mention a solid score by BAFTA award winner, Abel Korzeniowski (Penny Dreadful, Nocturnal Animals), which was an absolute highlight for me. The soundtrack is, at times, stirring and downright terrifying but always providing an ominous ambiance and, much like Valak herself, cannot be escaped. The presentation falls a little flat with the rote, special features section providing a few pedestrian featurettes. A New Horror Icon: has James Wan and Cast & Crew discussing why Valak is so scary. Gruesome Planet was cool, proving the shooting locations, and the Conjuring Chronology, for those of you interested in a timeline of events. All in all, The Nun is a creepy, if uneven, film with too many jump-scares and not enough real ones. It takes a truly scary horror character and leaves us wanting more from her. That's not to say the entire film was a wash, and obviously from its box-office success, raking in over $365 million, worldwide, from a $22 mil. budget, it would appear that we have not seen the last of Valak, the Demon. Let's say a few "Hail Mary's" and hope our prayers are answered for a more interesting, and terrifying, sequel. 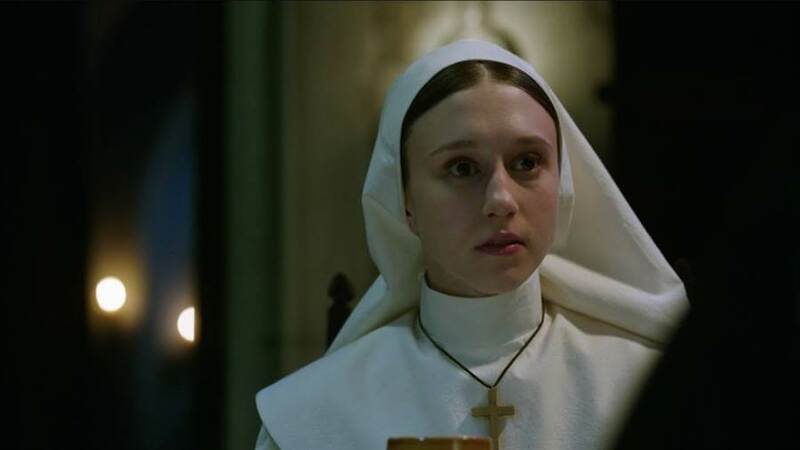 The Nun images © New Line Cinema. All Rights Reserved.